Did Honda/Toyota Pricing Open the Door for the new Sedona? Today's Morning Shift reported that minivan sales are holding strong, even though the automakers refuse to use the term "minivan." I used to not think too much about this vehicle segment. But parenthood changes you, on a recent road-trip I pondered the possibility of a diesel powered minivan and when my son got car-sick about two hours into the 12+ hour ride I came to the realization that the Honda Vac was a brilliant idea. I also happen to think that the current generation Sienna SE, looks kinda cool….but not as cool as the new Kia Sedona. Yeah you can go and take my Jalop card now...I'm talking about the coolness of minivans. More important than the "coolness" of minivans is the price, and it is price that allowed a bargain Korean minivan a new chance in the market. Chrysler invented the minivan, but many will agree that Honda and Toyota perfected it. While the Grand Caravan certainly is a nice ride, the default choice for most families seeking a people mover is split between the Odyssey or the Sienna. Both are excellent vehicles, but both have gotten pretty expensive over the years. While you can get a base van from Toyota or Honda for 27,780 and 28,825 respectively, fully loaded examples will set you back 45,280 for a FWD Odyssey Touring Elite and 48,290 for a FWD Sienna Limited (Premium package with options). That is luxury car territory for top-spec minivans. Of course you are getting luxury car features for that kind of coin, but without the luxury car badge. I don't fault Honda and Toyota for giving buyers high-end content and technology in a minivan and charging a premium for it. But this upmarket approach may have motivated a forgotten competitor to return and flourish. Let's take a step back in time….in 2006 Kia offered the Sedona for sale in the US market (also rebadged for a few years as the Hyundai Entourage). With a starting price of under 24k, it undercut Honda and Toyota by several thousands of dollars. Also at the time, these Korean vans could be had with serious discounts. A friend of mine purchased a new Entourage in '08 for 8 grand off of MSRP. This generation is still on sale and can be had with every option available for 34,695. Of course the current Sedona has been a dismal seller for the past few years, and Kia considered retiring the car for the US. Kia (and Hyundai) have been attacking luxury marquees with a simple approach: similar content and style for less money (see Cadenza, K900, Equus, Genesis). We can argue all day regarding subjective success on the style front, but the content value cannot be denied. The biggest obstacle holding Kia back in the premium market is the lack of a badge. When most people drop 50k+ on a luxury car they want the label to reflect that, but we have established that minivan buyers are willing to spend serious money despite the lack of a roundel or three-pointed star. 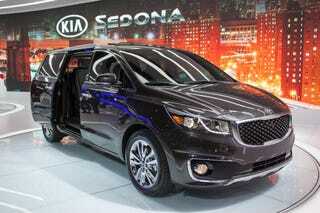 This is a golden opportunity for Kia to offer more minivan for less money than the Japanese. Also important to note, that minivan buyers tend to keep their vehicles for a long time. I'm sure that Kia's 10yr/100k powertrain and 5yr/ 60k comprehensive warranty will be a key selling point for the new Sedona. What I love about minivans is they do not pretend to be anything else. They aren't beige family cars dressed up as a sports-sedan, they aren't awkwardly shaped crossovers trying to out lap exotics. Minivans are made to move people in things comfortably, their evolution directly relates to that purpose. And while most people don't get a van to "look cool" it certainly doesn't hurt if their people mover has some presence. It would seem that the price creep upward on the part of the Sienna and Odyssey has given Kia an opportunity to make the Sedona a success. If you were in the market for a "people mover" would you consider the new Sedona?